Kachina Indian doll made from wood. He is wearing a vinyl skirt, belt and beard. His mask (with eyes and horns) is made from wood, and he has feathers on head. He is hand painted and his hands and feet are trimmed with white fur. He is holding a wooden tool. Signed: "Broadface by : A. S. ‘99" Tag: " Kachinas: Originally, the kachina doll was devised as a teaching tool given to pueblo children as part of their cultural and religious training. It is estimated that there are more than 250 different kachinas with several new additions added periodically. 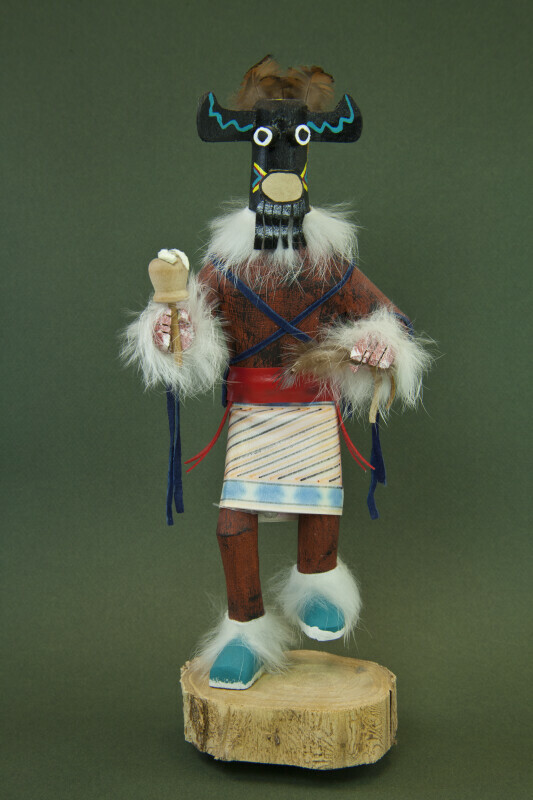 Each kachina has a specific function and is believed to be the spirit of an animal, bird, plant, object, place or person. The ancestral kachinas were supernatural being or spirits. These benevolent entities once lived among the people to teach them basic living skills for well-being. These skills included the art of hunting, tool-making, and healing. Some kachinas instructed on maintaining and restoring harmony within the village and living in harmony with nature to bring rain and fertility to the ground. There were also kachinas who taught the art of offering spiritual gratitude." The figure stands 11 inches (28 cm) tall.